There is something about fondant that just makes everything so beautiful. Don’t you agree? For years bakers have been turning out gorgeous wedding cake after wedding cake. They have been able to do such a thing because of one concrete-like material: fondant. It might not be the tastiest thing in the world…but it sure is pretty. Now bakers are starting to take it to the next level and produce fondant covered cupcakes. Like these red velvet ones that the we featured a few months ago. Another cool thing that I am starting to see pop up lately are cupcakes like the one featured here. We have two yummy chocolate cupcakes…one frosted in chocolate the other in vanilla. Simple right? To bump it up a notch this baker cut small squares of fondant and used a special bride and groom stamp to create the cutouts on top of the cupcakes. Imagine all the different things that you can do with this technique–animals, shapes, bows…I could go on and on! 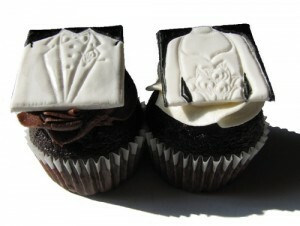 The best part…you can just pop off that fondant piece and chow down on a delicious cupcake. Unless you like fondant…which I do not.